The only reward that await supporters of politicians without ideology is keeping of multiple enemies across all political divides . Just recently in Benue politics, it was 'operation destroy Suswam'. 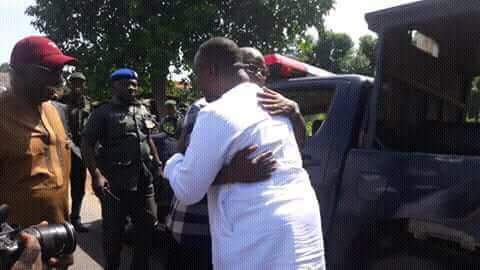 Millions of supporters invested all their time, resources and energy in the project until the sudden news of reconciliation presided over by the Tor Tiv came in to the greatest shock and disappointment of many especially those who were feeding fat on the perceived conflict. We were made to think that Suswam made away with all the resources meant to give life to the Benue people. Whether those monies have been recovered or state pardon granted to the alleged looter or it was a false accusation, all these have become history. What matters presently is that Ortom and Suswam are together pursuing a common goal, 2019. While the perceived conflict lasted between the two politicians , supporters from both sides cried lauder than the bereaved; taking issues very personal against themselves. Now I ask such gullible and blind supporters, where do you go from here? For those who refused to learn their lessons, a bigger shock was given to them- the break off between the governor and his master. This again divided the once united supporters group into two - one going with each side of the divide . How do you you now feel when you remember how you were once together planing attacks on political opponents and critics ? The greatest shock however is the most recent handover of the PDP structures in Benue State to the governor. Many of these blind supporters are yet to recover from it. Some of those who were hitherto attacking the governor and his administration are shamelessly making a U-turn. What an agendaless people ? The question is , is it over yet? certainly no. From now till the time for primaries and shortly after that, expect more shocks from these guys. It is on this note that I advice members of Blind supporters Association of Benue not to insult or attack anyone yet until it is clear to you which side you are following. Finally, take it or leave it, there is no conflict among the Benue political elites . What you may call conflict is simply a clash of personal selfish interest , once it is resolved , they come back to the same page and same mission which is to grab resources meant for the common man and further empoverish the already economically dehumanized citizens of our state. There are still very skeletal number of responsible politicians in the state ; go for them. From the desert voice .